Almost all evidence of past climates and climate change comes from “proxy indicators”: components of our physical environment that responded to the climate conditions at the time of their formation or presence and that have left evidence of their existence behind. Examples are the fossil remains of plants and animals in rock, deep sea cores, and cores taken from bogs and lakes, and the chemical composition of shells and ice. Such proxy indicators have revealed the occurrence of important events in earth’s history, such as mass extinctions and ice ages, which have been used to divide the climate record into major and minor time units. For example, we are currently living in the Cenozoic Era. The beginning of this era is marked by a mass extinction of species, including the fabled dinosaurs. 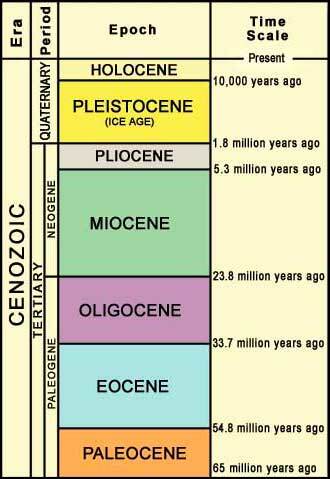 The Cenozoic Era is subdivided into the Tertiary and the Quaternary Periods; the boundary between these is defined in terms of a global cooling and the beginning of the first of several major glaciations around 1.8 million years ago. The most recent of these glaciations, referred to as the “Wisconsin Glaciation,” ended about 10,000 years ago. The climate of the most recent epoch, the Holocene, although warmer than that during the Wisconsin Glaciation, has not been constant. The warmest part of the Holocene (at least for North America) occurred around 9,000 to 7,000 years ago. A recent cold period, referred to as the "Little Ice Age”, occurred between 1650 and 1850 A.D. Temperatures have been rising since then, and continue to rise at an increasing rate. The past several decades have been the warmest in 400 years and possibly the warmest for several millennia. The Sylvania Wilderness has the mid-latitude continental climate of Upper Michigan, characterized by cold winters and mild summers. The Keweenaw Ridge to the northwest shelters Sylvania from Lake Superior’s cold, harsh winds. Landmasses warm up more quickly and cool more rapidly in response to variations in the amount of solar radiation they receive as compared to the oceans. This difference between winter and summer temperatures is amplified in middle and high latitudes by their long summer and short winter days. In January (coldest month, usually), the average temperature is about 11oF (-12oC) and the average daily minimum is about 1oF (-17oC); in July (warmest month, usually), the average temperature is about 65oF (18oC) and the average daily maximum is about 78oF (26oC) . Interior continental locations in the middle latitudes tend to have a relatively dry climate because of the great distance to tropical oceans, which are the most important sources of atmospheric moisture. The annual precipitation total for Sylvania is about 30 inches (762 mm). Most of this falls in summer when moist tropical air masses frequently reach the area. The average monthly summer precipitation is between 3 and 4 inches (76-102 mm). In winter, the average monthly totals are only 1-2 inches (25-51 mm). This may surprise visitors to the area who find themselves skiing on a 3-4 foot (about 1 m) snowpack in spring. In fact, the annual total snowfall averages 100-120 inches (25-30 m). The reason for the difference between the thickness of the snowpack and the precipitation total is that snow is fluffy. It tends to be about twenty times as deep as its water equivalent in the Sylvania area. About half of the annual snowfall total is lake-effect snow from Lake Superior (Harman 1984). Lake-effect snow occurs when cold and dry arctic air masses move southward out of Canada. Water from the open water surface of Lake Superior evaporates into these air masses and then falls as snow as the air masses reach land. Evapotranspiration (the amount of moisture lost from the land surface through evaporation and transpiration by plants) is driven by temperature and is therefore low because of Sylvania's cool climate compared to that of more southerly locations. The annual evapotranspiration is 15-20 inches (381-508 mm), which is significantly less than the annual precipitation. There is, therefore, in spite of the small amount of precipitation, a considerable net downward movement of water through the soil, especially during spring snow melt and during intense rainstorms. This is an important factor in the recharging of ground water and the formation of the soil. Long-term wind data are, unfortunately, not available. The occurrence of tornadoes, because of their violent nature, is recorded. According to that record, 3 tornadoes have touched down in Gogebic County between 1950 and 2008: F-1 in April 1984 (3 pm), F-0 in August 1988 (8 pm), and F-1 in May 2005 (5 pm). The F-scale refers to the estimated maximum wind speed: F-0 = 40-72 mph (18-32 m s-1) and F-1 = 73-112 mph (33-50 m s-1).